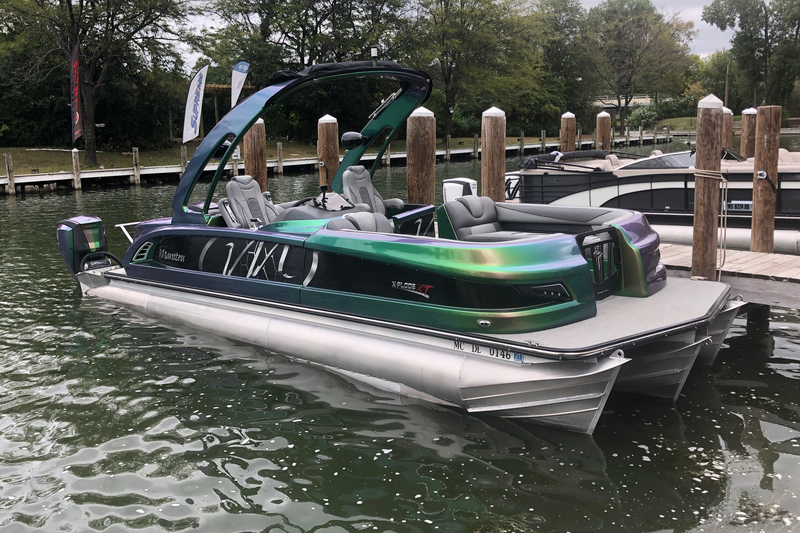 Gamified boat docking, high-power two-strokes, and a 600-horsepower pontoon — here’s the latest and greatest from Evinrude Outboard Engines’ on-water demo. Last week, the GearJunkie team headed down to purify ourselves in the waters of Lake Minnetonka and snag an in-depth look at Evinrude Outboard Engines’ new lineup. It was well worth the trip. We left sporting the same goofy perma-grins as kids leaving an amusement park. Fittingly, we arrived by boat. Evinrude walked us through its history, product specs and stats, and the bygone days of early buoyant propulsion. Then, we eagerly got on the water to try the latest tech. These three products stood out at the event. The hero of the show was Evinrude’s two-stroke, 150-horsepower high-output motor. 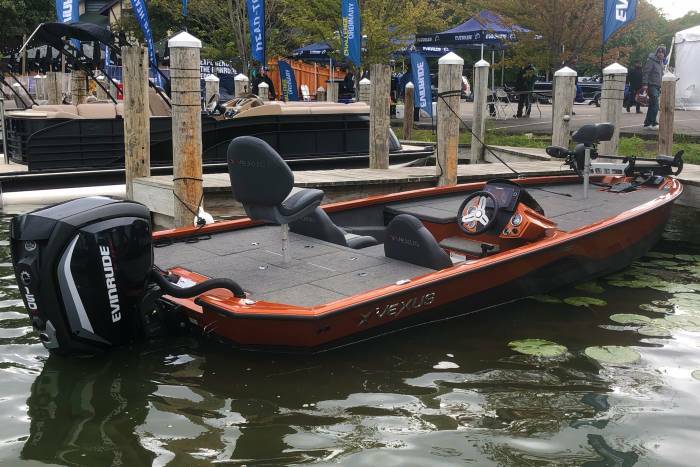 Demo staff showcased similar configurations on a sparkling new 19-foot Vexus fishing boat and an 18-foot Alumacraft. The standouts on this tough little two-stroke have ridiculously low fuel consumption, emissions (undetectable while operating), and volume through the entire power range. To test it out, we found a head-to-head demo setup with two identical boats. The only difference was the motor: One was equipped with the 150 high-output, the other with the popular Yamaha four-stroke. During the on-water test, our Evinrude pilot pointed out fuel consumption for both motors at the same RPMs, and the Evinrude was clearly using less fuel. And the Evinrude claimed 37 percent more torque than the Yamaha. This was definitely noticeable in acceleration when pushing the boat onto a plane quickly, and while holding RPMs through the turns. Plus, the entire setup on the Evinrude looked much cleaner. After the head-to-head, we stepped onto what I can only describe as a swim platform with rocket thrusters attached to the back. What I initially thought was a grotesque display of power by Evinrude’s top-of-the-line motor was actually part of a growing category of pleasure boats geared toward wealthy waterfront residents. Two pontoons — a 30-foot Bennington and a 25-foot Manitou X-Plode XT — each bore twin 300-horsepower Evinrude outboards. The result was two veritable floating living rooms capable of jetting to 60 and 65 mph, respectively. When the pilot told me to “hang on” before gunning the motors, I chuckled. How fast could this small luxury liner go? Then I was promptly (and karmically) thrown back in my seat, like Tesla’s Ludicrous mode. To say I was shocked and impressed is an understatement. Of course, that fun machine comes with a king’s ransom — a setup like that runs about $140,000. The final cool piece of tech we played with was the iDock system. Released last year, the arcade-like tech is now in full production. 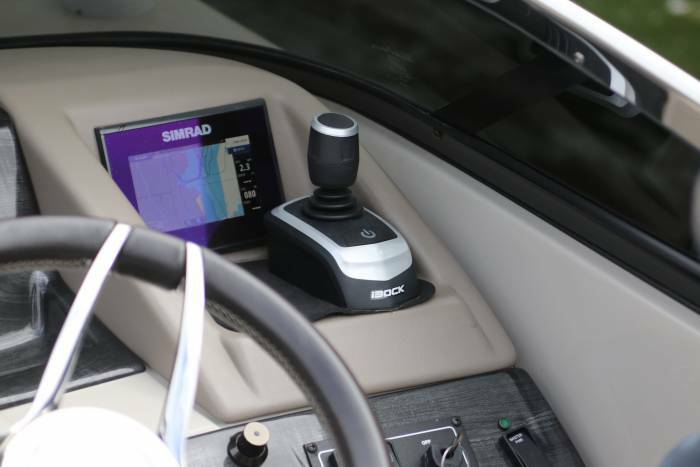 In a nutshell, iDock combines a joystick with a small computer to help dock a big rig in strong currents, high winds, or both. Docking large vessels can be gut-wrenching, even for the saltiest captains. But the iDock system makes the process easier and more fun, giving amateur drivers extra confidence in bad conditions. Move the system’s joystick in the direction you want the boat to go, and the computer tells the motors exactly what to do. Push the joystick harder to go into boost mode, twist the joystick, and the boat pirouettes on a dime like a 30-foot Pac-Man. To learn more about Evinrude’s product and to see what else the company is up to, check out its website here. Oh, and if you doubt the power or torque these outboards can crank, check out this Guinness World Record video. 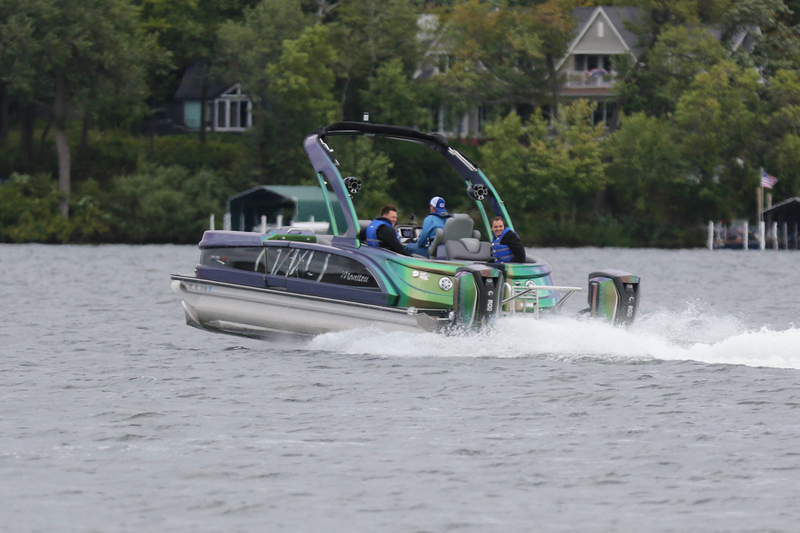 Three Evinrude motors pull 32 barefoot waterskiers with 3,300 horsepower!